“In Battlefield Earth, I present a situation where mankind has almost been wiped from the face of the Earth by advanced technology and is now imprisoned not so much by the aliens who dominate the planet but by superstition…. “Thus they were first trapped by their own ideas. “When the hero, Jonnie Goodboy Tyler, decides to leave the mountain sanctuary of his dying tribe, he is first of all breaking free of superstition…. 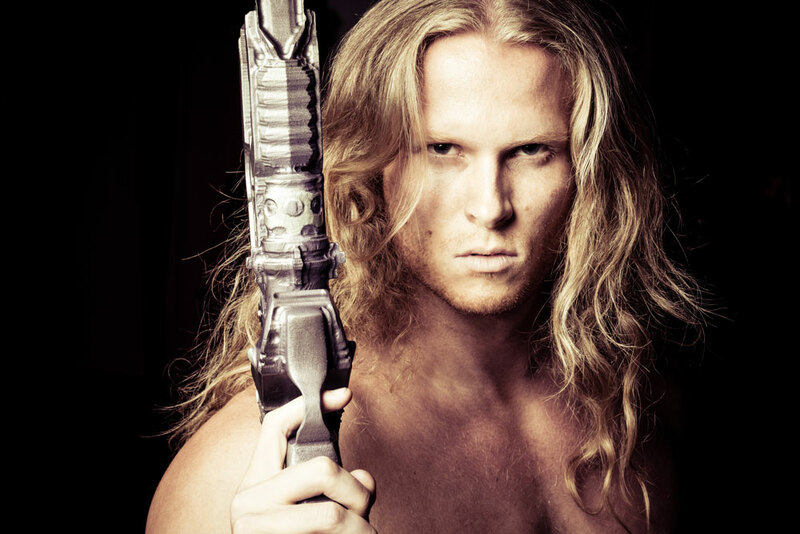 At 20 years of age, six feet tall and muscular with his corn-yellow hair and ice-blue eyes wearing his buckskin attire, Jonnie Goodboy Tyler is clearly the hero of this science fiction epic. His journey begins when he stumbles across what he eventually learns to be a library and discovers books. It is through education, study of man-books, study of Psychlo books that teach him science, economics, diplomacy, finance and all the other matters he will eventually have to face. And it is from this that he is able to teach others in their quest to overthrow their oppressors against impossible odds. “Johnny has lived in his village all his life, with the population continuing to dwindle, never enough food. They have always been warned away from straying because of the ‘monsters,’ which Johnny has never seen and has become to suspect are merely myth. Johnny sets out from the mountain village to explore, discovers the remains of an ancient city… and that the‘monsters’ are quite real. One of the best scenes depicting Jonnie’s attempt to unite human kind is in the following audio clip from the Battlefield Earth unabridged audiobook, where he has flown to Scotland with Terl to recruit 50 men to help him mine gold for Terl. In reality though Jonnie is only now starting to create a force of fighting men, who can be trained to fight their oppressors.